Konishi Hirosada (ca 1810 - 1864) Ogura no Shikishi, 1852. Deluxe Chuban Diptych. This fascinating diptych tells us very little and at the same time reveals such a lot. The play it depicts is a drama, Ogura no Shikishi, performed in Osaka in 1852, it is likely that one of the two actors is Jitsukawa Enjaku. There is an almost identical print of the same subject in oban format in the Museum of Fine Arts Boston, although no real reason as to why Hirosada should have produced two such close designs of the same performance. What is revealing about the print is the candidness of the stage craft: the fox is drawn not as if it were a scene from a real event, but as an actor in a clearly identifiable fox costume for the stage. Hirosada has drawn the foot and hand gloves and also the removable flap beneath the head which enables the actor to be able to see to get about. The degree of realism that ukiyo-e artists employed is not fixed, as we have seen with other prints in the show; some kabuki-e are indistinguishable from real life events, where the stage props and painted backdrops are rendered as if real and the scenes depicted might be convincingly exterior. 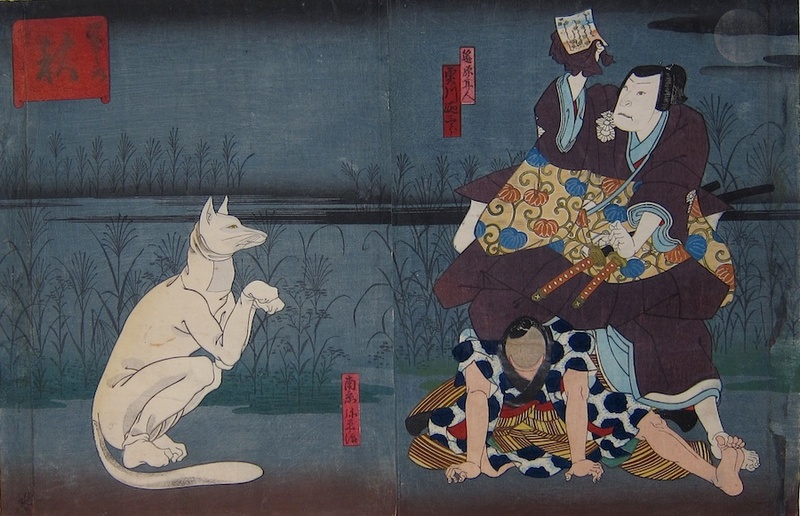 There’s a little of both going on here; the two figures are rendered accurately and match the candid realism of the actor in the fox suit, the backdrop however is depicted as a real, outdoor, moonlit scene with no sense of the stage floor - all of which heightens the peculiar presence of the fox spirit. Aside from what is being represented, we see a superb, de-luxe Osaka diptych with lavish use of gold pigment, burnishing and applied lacquer with intricate fine gauffrage to the white fox fur. The background is delicately rendered in fine overlapping monochrome shades and the moon and clouds are defined with delicate bokashi shading. Colour and impression very fine, album folds now flattened, two full size sheets with left margins not attached.